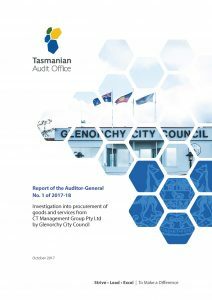 A referral was received by the Tasmania Audit Office relating to Glenorchy City Council’s (Council) procurement of goods and services from CT Management Group Pty Ltd (CT Management). Following an initial review, the referral was accepted for assessment by the Auditor-General and an assessor appointed on 7 December 2016. The assessment was conducted between 7 December 2016 and 30 June 2017. The assessment did not identify any material to warrant dismissal of the matters raised in the referral, and the assessor noted that further investigation was necessary in order to fully examine the matters raised. On that basis the assessor recommended that the referral be investigated in accordance with section 23(d) of the Audit Act 2008. 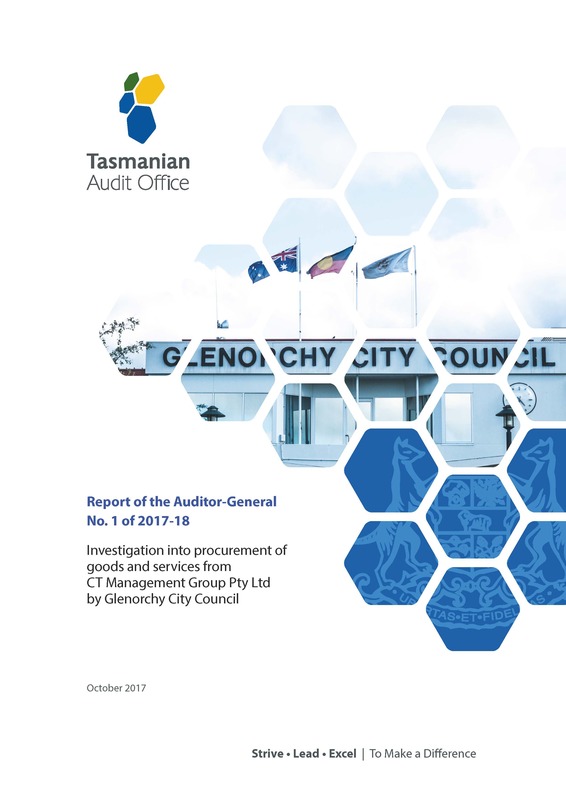 The Auditor-General decided to conduct an investigation, pursuant to section 23(d) of the Audit Act 2008, into the procurement of goods and services from CT Management by Council. Council’s internal policies, procedures and manuals.